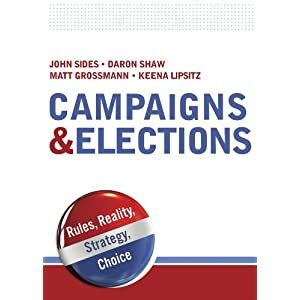 The basic question driving the 2012 campaign was always clear: could Mitt Romney gain enough of the vote among older, upper-income white Americans to overcome President Obama’s overwhelming advantage among young, low-income and minority voters? . . . But there’s much more to this story. The maps we have made show that the election was not just about red and blue states. What’s actually going on is that the division between red and blue America is mostly about a split among richer voters. To picture this, imagine two alternative universes for the 2012 election. In the first, only individuals making less than $50,000 a year can vote; in the second, only those making more than $100,000 a year can. Based on exit polls from Election Day, we have a decent idea of how these scenarios would play out. In the first universe, Barack Obama wins in a 1984-style landslide, with a near sweep of the Electoral College and around 60 percent of the popular vote. In the second universe, Mitt Romney wins with a healthy 54 percent of the popular vote. Though he still carries the red states, a landslide remains out of his grasp — wealthy voters in blue states like New York and California still support Obama by comfortable margins. We’ll come back to this thought in a moment. The maps above show the election results for four income groups as measured by exit polls (with blanks for the states that were not polled). Remarkably, this same pattern has occurred in every presidential contest over the past twenty years. . . . In other words, contrary to what you have heard, there’s only a strong red America-blue America split toward the top of the income distribution. Toward the bottom, the electoral map is a sea of blue. Why does this happen? Our research on opinion poll data from earlier elections finds that lower-income Americans tend to vote based on economic issues, while richer voters consider social issues as well as economics in their voting decisions. This is sometimes called post-materialism: the idea that, as individuals or groups become more comfortable, they can afford to think beyond their immediate needs. The so-called culture war between red and blue America is concentrated in the upper half of the income distribution, and voting patterns reflect this. 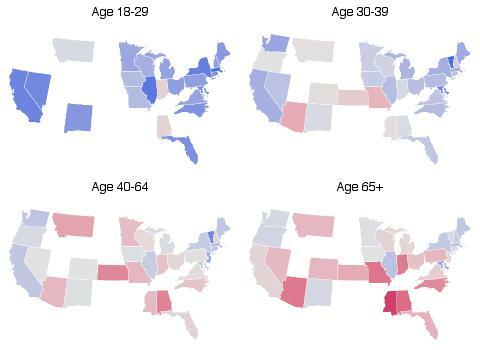 We can break down the electorate by age similarly. . . .
One thing I’ve wondered is have you done this by an income level within-state? After all, a family income of $50K in would put the family into above-state-median comfort in some states, but not others. It would be interesting to see the first four maps (the income ones) controlling for ethnicity. In other words, a set for whites, a set for blacks, and a set for Hispanics. Of course in the latter two sets you’d run out of respondents in the exit polls in lots of those states, but still…. I agree with Kevin. The map I would really like to see is for whites (and maybe white males, if there are enough data) with income under $50k. You seem to be implying that whites in the south with income under $50k aren’t in the culture war, but it could be that a large share of voters in that income bracket are minorities, and all the whites in the low income bracket voted GOP. I don’t know if that’s the case or not but that would seem to point to a different conclusion than the one you’re drawing. I’d love to see the data. I’ll be intrigued as well. Larry Bartels forcefully pointed out that lower-income white vote more Democratic than higher-income whites in every state in making his argument that lower-income whites focus on economic conditions more than the upper crust. I’m curious whether this ‘rule’ held for the 2012 election as well. What Bartels did not focus on much (if memory serves me correctly) is that voting behavior among whites ACROSS state boundaries–e.g. that lower-income white in Nebraska or Mississippi could (potentially) vote more Republican than the highest income whites in Massachusetts or Vermont. I suspected by minimizing this factor he had not so thoroughly debunked the thesis of ‘What’s the Matter with Kansas’ as he may have hoped. While Franks may not have gotten it right, I’m not sure if anyone really has found a relatively simple model that has de-mystified the complexities of voting behavior adequately. It’s almost like we’re less certain about anything in 2012 than those Michigan School guys were back in 1960. As we discuss in our book, upper-income whites vote more Republican than lower-income whites. But in recent years that difference has not been large. In support of Kevin and Tyson let me add that when Republicans call themselves a party of the working class, it is only whites they are talking about. Indeed , adjust the Romney “white vote” to account the number of Jewish voters who went for Obama and the advantage for Republicans grows. I’ve got to say that I had the same idea as Kevin, Tyson and Vladimir. Maybe if enough people ask, we can get a post that breaks down income by race/ethnicity? Please? Hi–we did this for 2008 (see here), we just need individual-level survey data to do the same analysis for 2012. I’m missing the slice that distinguishes between urban and rural mindsets. In Washington state, there is also a political rift between the western and eastern sides of the Cascade Range, although that may simply be another expression of urban vs. rural. There is nothing in E. Washington that comes close to the magnitude Seattle-Tacoma-Everett metropolis, and these geographic attributes are frequently cited when (e.g.) the east is faced with a statewide funding issue that primarily benefits the infrastructure of the west. Races for political offices can reflect the geographic divide by extension. That reminds me of that old saw about Oregon, which goes something like: “people in the west smoke dope and people in the east smoke Elk” or some such thing. I would assume this humorous logic also has some grounding in reality in Washington as well? That sort of thing plays out in just about every state in the Union. Here in Florida (I’m in Miami) you may have noticed that a bunch of yahoos sent a secession petition to the POTUS. I think what they are mostly wanting to do is not secede from the US, but to have the rest of the state secede from South Florida. I’m sure all of us could come up with these sorts of yarns and anecdotes about all our states. He’s gonna tell us to get off our butts and do it ourselves, isn’t he??? If the world is data-driven and the readers of the data are analyzing it–this should tell the Ohio right frat boys that their days as legislators and governors are over–unless they can find a serum to keep old, white people alive forever. Wow–that’s probably a really bad idea, ’cause they’ll poop all over the place, break hips in assisted living retirement homes, etc. And then we’ll need lots of low-wage non-white or fully-toothed people to clean up–oh, the irony. 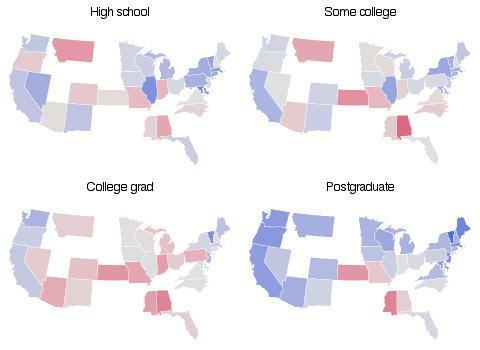 White + Postgraduate voters vs.
Non-white + Postgraduate voters vs.
White + High school voters vs. Since I’m a fan of R and its mapping constructs (and would like to play around, too), is the data available? 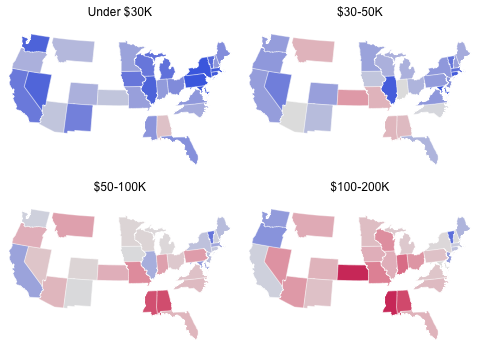 Oregon and New Jersey are both noticeably more blue in $100K-200K than in $50-100K. Is it real or noise? If real, why? — And is it the same reason in both states? This is an interesting take on why the election turned out the way it did. I find that a lot of people focus on red states and blue states. They don’t take the time to look into each red and blue state and see why it turned out the way it did. Because it is possible that even though the state went one way, that doesn’t mean the entire state went that way just enough people did. I therefore really like your focus on income as a result not just red state, blue state. thought this was a very interesting way to look at the election outcomes, especially from the economic perspective. It seems the break down of votes based on financial situation, age, race, and education levels are what most Americans would expect them to be (i.e. Americans making less money tend to vote Democratic, older Americans tend to vote Republican etc.). Since we already know what the breakdowns are, I think it would be really interesting to consider why they are the way they are. Maybe if the Democratic and Republican parties thought about this too, and tried to cater to the needs of all Americans, even those outside of their parties traditional demographic, then maybe, just maybe, things would get accomplished in America. I know this is easier said than done, but recognizing the fact that both parties alienating certain parts of the population is a problem would be a good start.